I can’t believe I never saw this amazing dog before. But her video has over 17 million views so this dancing phenom is getting her day in the spotlight. It’s obvious she loves doing this, the joy she shows twirling and prancing. Doesn’t look like some trained dogs just going through the motions. She has the biggest smile and just relishes her turn as the belle of the ball. 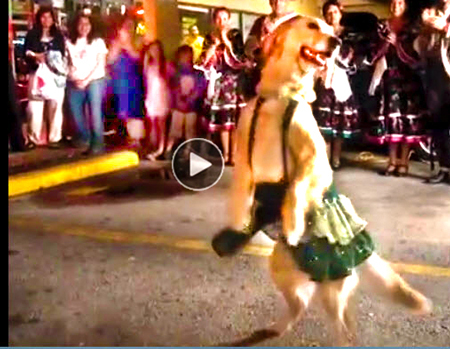 This clip is over two minutes long and she’s dancing on two legs almost the whole time. Enjoy! This entry was posted in Funny Dog Videos & Cat Videos - dogs, cats and other animals doing humorous & cute things and tagged best dancing dog video, best dancing dog video ever, best funny dog videos, dancing dog video, dog doing funny things, dog videos, free funny video clips, funniest animal videos, funniest dog video, funniest dog videos, funny animal video, funny animal videos, funny animal videos for kids, funny animal videos youtube, funny dog video, funny dog video youtube, funny dog videos, funny dog videos for kids, funny dog videos youtube, funny talking dog videos, funny video, funny video clips, funny videos for kids, funny viral video, humorous dog video, humorous dog videos, humorous video clips, humorous youtube video clips, top ten funny dog videos, video humor, video jokes, youtube funny dog video, youtube funny dog videos, youtube funny video, youtube funny video clips, youtube funny videos, youtube videos funny, youtube videos that are funny.